Here we go with another great DVD featuring everyone's favorite little man, Bob the Builder and some new adventures to keep the little ones enraptured. Everything from the catchy intro tune which we all know, through to the beautifully bright presentation, Bob and his friends have something for every child from about a year and a half to five years old, and their parents! This DVD has 5 life saving episodes on it that in it's entirety goes for 50 minutes. They are present in full screen 4:3 ratio that is preferred for our younger viewers and the great thing is that the duration of each episode is such that your little person can make it through a show without losing interest. 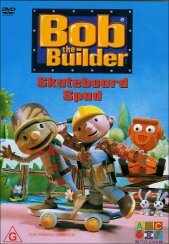 The main episode of course is Skateboard Spud and revolves around the scarecrow Spud getting tired of how slow Farmer Pickles tractor is and making himself a skateboard to go crazy on. As always though, whenever Spud makes something or tries something out, not everything goes to plan and you just know it'll be up to Bob and Wendy to sort it all out! The disc has no extras but considering the quality of the release, I don't think your kids are going to notice. I have no problems saying that this disc will be a winner in any home.